This exhibition will feature approximately 40 of the artist’s magazine and advertising illustrations, as well as Dolas’ collection of 10 original “Saturday Evening Post” covers by J.C. Leyendecker. When Michael Dolas (1912-2010) passed away just shy of his 98th birthday, he was one of the last of the artists from the Golden Age of American Illustration. 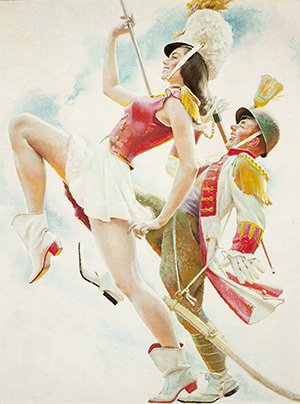 A friend of iconic artists of that era such as J.C. Leyendecker and Norman Rockwell, Dolas began his career in the 1930s painting illustrations for numerous national magazines. During WWII, he served as a combat photographer in the Pacific. Dolas returned to New York following the war and in addition to his resuming his magazine work, he began creating advertising art for a host of nationally-known companies. In the mid-1950s he and his family moved to California where he continued to work on various commercial art projects for several decades.